Everyone knows the feeling of finding that one cafe or restaurant which meets all of your needs. Whether it’s the way they brew coffee or their daily specials, we all want that place that knows what we like without us saying it directly. For many beef lovers, this is a difficult task. They get disappointed more often than not with the beef selection in their hometown. There’s always something in the way. Whether the meat isn’t fresh, whether it’s processed or even if the service is bad – they just have to keep looking relentlessly. On the other hand, jerky lovers have more luck in this department. Good jerky can be found very easily. At the store, the farmer’s market, even at the gas station – the availability is at their convenience all the time. So what about good beef jerky? This is definitely the hardest to find. If we get it from the store – it has to be pricey. So, good beef jerky can almost only be found in places which specialize in beef. But we do not come by these joints as much as we come by pizza places, for example. So what gives? Well, this is probably due to the fact that good jerky is not as easy to make as pizza is. Pizza and other fast food can be made easily from scratch and scarce ingredients but with jerky, this is often not the case. This lean meat is dried and salted to a tasty chewiness and is seasoned carefully. This counts as one of the top favorite snacks of every other American. It is very practical and doesn’t need refrigeration which is why this is a perfect food on the go. Though often served as “clean” jerky, this product is also liable to contain highly processed meat. They can even contain an astonishingly high level of sugar which of course does not make good jerky. But if you are lucky enough to find a good jerky place, hold on to it. 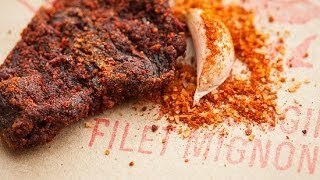 Remember, jerky made with good beef can even contain 65% protein which is a rarity among fast food. Jerky comes in such a variety of flavors and meats that it is hard to keep track. Not only does horse and squid jerky exist but there are desserts which contain sweet and tangy jerky. Even cake mixed with jerky is available nowadays. Still, there are people who see only beef jerky as the real deal and they have a hard time finding their food haven. Sure they can get the store-bought jerky, but you have to admit there’s something about sitting down in a restaurant and getting proper service that outweighs the practical side of store-bought food. How Healthy Is Beef Jerky?